Get the panoramic view of the Statue of Unity – the world’s largest statue, Sardar Sarovar Dam, Narmada River, Vindhya and Saputara hills in just 10 minutes. After buying tickets for ferry service and reaching near the Statue of Unity you can take a helicopter ride around the Statue of Unity. The Helicopter ride was started on 23 December, 2018. The cost of Helicopter ride for 10 minutes is 2900 Rs per person. The chopper can carry five to seven person per ride. On first day itself about 6 media person and fifty-nine other people experienced the Helicopter ride. Except on Mondays, the Helicopter ride can be availed on all the days, as the Statue of Unity is not open for people on that day. On Monday, maintenance work is carried out at the Statue of Unity. The Statue of Unity was inaugurated by the Prime Minister of India, Narendra Modi on 31 Oct, 2018. The statue was built at a cost of 3000 crores. On this first 11 days of its inauguration the statue has witnessed about 1.3 lakh tourists. The Government expects approx. 15000 tourists everyday to the Statue of Unity. The Statue of Unity is located on Sandhu island in Kevadia village. The beauty around the statue is mesmerising. The 182 meter tall statue of the Iron Man of India stands strong beside the Sardar Sarovar Dam. Government is also arranging for accommodation for the people visiting the Statue of Unity. 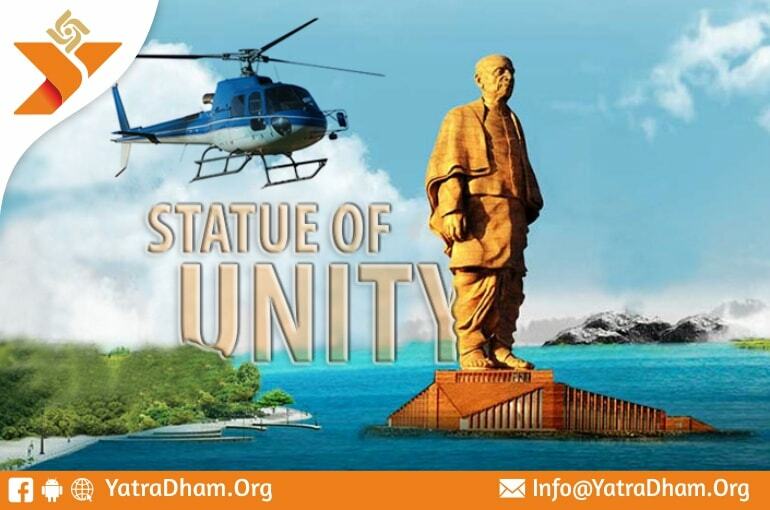 So, the helicopter ride will make your trip to Statue of Unity much more enlightening. હેલીકોપ્ટર ની ટીકીટ ક્યાં થી બુકિંગ કરી શકાય?